Wordless, yes. Stingless, no. 🐝 Benadryl and ice, yes. 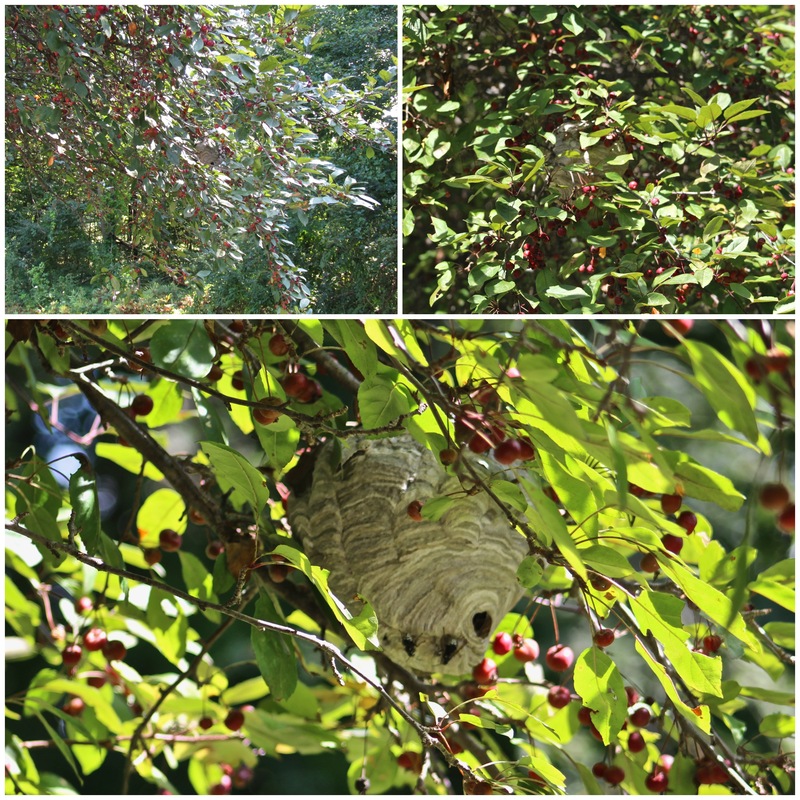 This entry was posted in Photography, Wordless Wednesday and tagged Benadryl, Gardening, Hornets, Insects, Nests, Paper wasp nest, Stings. Bookmark the permalink. Ouch!!! Hope it wasn’t too bad! You’re just too sweet for your own good!! Read my lips: HAZMAT SUIT!! Meat tenderizer for the stings – digests the venom. Oh, no! From experience, I know that hurts like a son of a gun. Nasty hornet I think. Ouch!!! Oh my! Feel better! Cool shots! I’m allergic. Keep those away from me. I clicked like, but only for the first pretty photo. Not for the ouchie ending to this story. Oh my, perhaps the Garden Gods are telling you to take a break. Oh no, Judy! I’m sorry you were stung. But how well disguised that nest is, and how really beautiful the entire structure is – with everybody knowing what to do and where to go. Nature at its finest – although that’s not always good for us! The WORST sting ever. I run when I see bald-faced hornets! I admire the way you bring the viewer in, closer and closer, with your photos. You know, of course, for me that would happen only with photos; no way I’d go that close for real! But then to have them fly up in your face from that tank — yikes! I swear I jerked up when I read that! Those stings are horrible, and I’m sure hoping you’ve had the last of them. As for buying hornets’ nests on eBay, why bother? Just tune in to the news! Oh no Judy, I remember you were stung badly by bees last year, and now the hornet’s nest! Once the weather cools down you could do your gardening in those bee suits (the ones that look like astronaut suits)..in the meanwhile, keep away from the nasties. I love the sequence of shots–“oh, that’s pretty . . . wait, what’s that? . . . eeeeekkkkkk!” SO glad you are okay! OH, NO! I’d risk getting stung for those cherries. I’m so sorry you got stung! I’ve only been stung once when I was 12 or 13…I had armpit hair. I got stung in the armpit. My mom couldn’t tell the stinger from the new growing hairs in my armpit! So, it had to stay in and work it’s own way out. I hated puberty even more that day. I hope it was easier for you get the stinger out, and it didn’t sting long! It was hard to hit like button on this comment! Getting bit so many times as you have I’d be worried about developing an allergy to the venom. Bee suit, and smoker is what I’d ask Santa for. Did you do something with the cherries besides eat them right off the tree? God’s creatures are amazing and beautiful, except when they sting!